PVMBG reported that seismicity at Colo declined during 1 September-25 October; 1-7 shallow-volcanic earthquakes and 1-3 volcanic earthquakes were recorded per day, which were rates similar to those recorded before a seismic increase in June. The Alert Level was lowered to 1 (on a scale of 1-4) on 26 October, and residents and tourists were warned not to approach the crater. Although a NOAA 10 weather satellite image on 14 July showed a cloud that extended ~200 km from the vicinity of Una Una, no reports were received of an eruption from the island, uninhabited since residents were evacuated before the paroxysmal explosion of 23 July 1983. Yosihiro Sawada inspected 14-15 July imagery from the GMS weather satellite. By 0800 on 14 July, less than an hour after the NOAA 10 image, the cloud retained a plume-like structure, but its origin was several tens of kilometers W of Una Una. An infrared image 24 hours later showed a chain of weather clouds extending SW from several sources just W of Una Una. On the image returned three hours later, these clouds had combined to form a plume-like feature similar to the one seen the previous day. This evidence, and the absence of a reported eruption, suggested that weather clouds may have produced the 14 July plume. PVMBG reports that seismicity significantly increased on 8 June, particularly volcanic and shallow-volcanic earthquakes; 12 volcanic earthquakes were recorded on 22 June (previously, 1-5 events per day had been recorded), and there were 11 shallow volcanic earthquakes on 23 June (previously, 1-8 events per day had been recorded). On 24 June the Alert Level was raised to 2 (on a scale of 1-4). However, observers at the Colo Volcano Observation Post in the Wakai village did not see plumes during April-23 June. Residents and tourists were warned not to approach the volcano within a radius of 1.5 km. An explosive eruption produced pyroclastic flows that destroyed most homes, vegetation, and animal life on 40 km2 Una Una Island and probably injected tephra into the stratosphere. Initial activity prompted evacuation of everyone on the island before the devastating explosions. The eruption was preceded by seismicity that increased from 9-11 felt events/day on 8 July to 30-40/day on 15 July. The number of recorded events was 33 on 14 July, increasing the following days to 49, 53, and 73 then to an average of more than 90/day 18-21 July. The strongest earthquake was felt 400 km away on 18 July. That morning, a 1-km column of ash and incandescent material was ejected. AFP reported that a strong explosion occurred 19 July, and thick gray clouds containing incandescent tephra were visible from Ampana, more than 100 km to the S, the next day. By the 20th, almost all houses and buildings in the eight villages near the volcano had been destroyed and nearly half of the residents of the island had been evacuated. All had left by the time of a major explosion on 21 July at 1623 that subjected 80% of the island to temperatures of up to 200°C. Tephra as large as 5-10 cm in diameter fell near a VSI observation vessel and the monitoring team reported flames on parts of the island. A government geologist estimated that all 700,000 coconut trees and all livestock on the island must have been burned, probably by pyroclastic flows. Ash darkened much of the region. People in Falu, 250 km away, were forced to protect themselves from ashfall until late 23 July. A VSI field party arriving on the island 22 July at 0100 felt ten earthquakes during their 15-hour stay and observed a 1.5-km eruption column at 1649. On 23 July at 2055, a British Airways jet (en route from Singapore to Perth) flying at 10.6 km altitude encountered an eruption cloud at 1.4°S, 120.71°E, about 150 km S of Una Una (figure 1). Pilots noted a volcanic smell, lack of visibility, and St. Elmo's Fire around the windshield. The aircraft returned immediately to Singapore and suffered no damage. On 24 July at 1930, a satellite image showed a cloud about 120 km wide, extending about 600 km S from Una Una. Earlier in the eruption, weather clouds had obscured the Una Una area. Press reports quoted a local government official who said that 80% of the island was covered by volcanic clouds on 24 July, burning vegetation and destroying trees. On 26 July at 0000, the Japanese GMS satellite showed what appeared to be a dense eruption column rising from the island. On the next image, two hours later, a fan-shaped plume was visible, probably in or near the stratosphere. High-altitude material was blowing SW and W, while low and mid-level debris was drifting slowly S to SSE. On 28 July at 0200 the GMS satellite showed a small plume over the island. By 0500 a plume about 60 km wide extended about 200 km WSW from the volcano. The plume appeared denser at 0800 and by 1100 vigorous activity fed a cloud that reached 118 E and at least 13.5 km altitude. At 1400 the plume stretched about 500 km to the WSW and was very dense within 250 km of the volcano. Temperatures and wind directions at the tropopause (15 km altitude) were consistent with the plume's direction of movement and coldest temperature (-76°C) from a NOAA 7 image at 1430 (figure 2). By the next image, at 2000, the plume had dissipated. The GMS satellite showed the beginning of another eruptive episode on 30 July at 1630. At 2000, a NOAA 7 image contained a WSW-drifting plume, similar to the one on 28 July but not as spectacular. Feeding of this plume was continuing at 2300; it drifted SW, then W toward Sulawesi. It extended from the volcano about 200 km to 1.5°S, 119.5°E on 31 July at 0200, but was dissipating three hours later. At 2000 an image showed what appeared to be an eruption column, but little activity was visible three hours later. Figure 2. NOAA 7 thermal infrared satellite image showing an 800-km-long eruption plume from Una Una 28 July at 1430. White areas are coldest (see gray scale at top of figure). The coldest part of the plume had a temperature of -76°C, indicating that it had penetrated the stratosphere. Courtesy of Michael Matson. Another explosive episode first appeared on the imagery 2 August at 0500. Before activity ended at 1700, a plume had moved about 200 km to theSW and reached roughly 9-12 km altitude. A dense eruption column appeared over the island 3 August at 0000 and extended roughly 120 km to the W and SW two hours later. The plume was relatively diffuse and appeared to have reached only the mid-troposphere. Satellite images indicated that another explosion started 4 August at about 1000, feeding a plume that moved about 350 km to the NNW. The different direction of drift was the result of a weather change; this plume probably remained in the troposphere. AFP reported an eruption on 9 August at 0835 that ejected a gray plume to 3 km. No activity was evident on satellite images until 12 August at 0130, when a plume was observed that was not visible two hours earlier. At 0300, NOAA 7 data showed a dense plume, similar to that of 28 July, extending about 300 km SW to central Sulawesi. Information Contacts: A. Sudradjat, VSI; N. Banks, HVO; M. Matson, J. Hawkins, O. Karst, and S. Kusselson, NOAA/NESDIS; AFP; Antara News Agency, Jakarta; UPI. Satellite images continued to show occasional eruption plumes through late August. After the 12 August plume described last month, activity was next observed on an image from the GMS satellite on 22 August at 1400, when a very small fairly bright area was present directly over the island, a feature typical of the initial stages of an explosive episode. This event developed rapidly with a NOAA 7 image 35 minutes later showing a bright plume extending about 60 km to the W. By 1700 (GMS data), it had moved about 120 km W from the volcano, and its leading edge had just reached the coast of Sulawesi. On the next image, at 2000, feeding from the volcano appeared to have ended and the plume was dissipating to the W. On 26 August at 1100, a GMS image showed a bright, newly-ejected plume about 40 km wide that appeared to have reached the tropopause. At 1400, a very dense high-level cloud about 80 km wide had spread W then SW about 250 km, but on a NOAA 7 image 1 hour later the cloud appeared to be dispersing and the eruption had clearly ceased by the next GMS image at 1700. On 29 August, GMS imageryshowed the beginning of an explosive episode at about 1930. By midnight, a moderately dense plume extended WSW along the equator, then turned abruptly to the SSW, reaching 120°E at 1-2°S. On the next image, at 0500, feeding from the volcano had stopped and the plume was nearly dissipated. Government officials noted that several villages [were] completely destroyed by the eruption and that all of the island's coconut trees had been killed. All of the people living on Una Una were evacuated before the devastating explosions 23 July. Officials anticipated that it would be several years before the island would again be habitable, so residents have been resettled on other islands until they can return. The WWSSN noted 66 events in the vicinity of Una Una beginning late 16 July. No earthquakes smaller than M 4.5 were tabulated, and most magnitudes were between 4.8 and 5.4. Of these, the 21 recorded by 20 or more stations had a mean epicenter of 0.09°S, 121.70°E (standard deviations for both latitude and longitude, 0.05°), about 15 km NE of the volcano. Depths of the same 21 events avaraged 55 km (standard deviation 7.5 km). Earthquakes recorded by the WWSSN had become less frequent by the time of the largest explosion 23 July; few were recorded after 26 July and none after 1 August. Other events in the region included single M 5.0-5.3 shocks on 27, 28, and 31 July, about 200 km ENE of Una Una at roughly 40 km depth; and M 5.5 and 5.1 earthquakes 20 and 31 July at depths of 299 and 272 km, 300 km WNW of the volcano. Information Contacts: M. Matson, J. Hawkins, and S. Kusselson, NOAA/NESDIS; NEIC; Antara News Agency, Jakarta. Since late August, no explosions have been reported by ground observers or seen on satellite imagery. Yosihiro Sawada searched all July and August images from the GMS satellite and provided table 1. Table 1. Una Una eruption cloud data extracted from GMS satellite images. Data are tentative; some apparent plumes may have been weather clouds. Times are the beginnings of image scans, which are completed in about 25 minutes. Images are returned 14 times/day at intervals ranging from 30 minutes to 3 hours. New explosions are indicated in the remarks column. Data shown in parentheses are for plumes that are detached from the volcano because explosive activity had (apparently) stopped. A new plume was sometimes ejected before remnants of the previous explosive pulse had dissipated; dimensions of the old plume are then listed in parentheses below data on the new activity. Coldest temperatures at the tops of plumes are shown. Courtesy of Yosihiro Sawada. Table 2. Times of Una Una eruption clouds with heights estimated by VSI geologists [23 July-26 August 1983.]. Maurice Krafft visited Una Una in mid-Aug. He observed and photographed the 22 Aug explosion (table 2 and figure 3) and pyroclastic flow deposits from previous explosions (figure 4). The entire island had been devastated except for a narrow strip of undamaged vegetation and villages along the E coast. Figure 3. Explosion photographed from the S on 22 August 1983. Pyroclastic flows from this explosion continued 500 m beyond the SSW coast of the island and 1 km beyond the NNW coast. Courtesy of Maurice Krafft. Figure 4. Coconut trees uprooted by pyroclastic flows on the SE side of the island, photographed 19 August 1983. Pyroclastic flow deposits from the major 23 July explosion were 5 m thick on the island's SW side. A plume from the summit is in the background. Courtesy of Maurice Krafft. Further Reference. Katili, J.A., and Sudradjat, A., 1984, The devastating 1983 eruption of Colo volcano, Una Una Island, central Sulawesi, Indonesia: Geologisches Jahrbuch, v. A75, p. 27-47. Information Contacts: A. Sudradjat, VSI; M. Krafft, Cernay. Imagery from the NOAA 10 polar orbiting weather satellite showed a plume that extended S then W ~200 km from Una Una on 14 July at 0708. VSI could not confirm that an eruption had occurred. Information Contacts: W. Gould, NOAA/NESDIS; VSI. Colo volcano forms the isolated small island of Una Una in the middle of the Gulf of Tomini in northern Sulawesi. The broad, low volcano contains a 2-km-wide caldera with a small central cone. Only three eruptions have been recorded in historical time, but two of those caused widespread damage over much of the island. The last eruption, in 1983, produced pyroclastic flows that swept over most of the island shortly after all residents had been evacuated. Katili J A, Kartaadiputra L, Surio, 1963. Magma type and tectonic position of the Una-Una Island, Indonesia. Bull Volcanol, 26: 431-454. Katili J A, Sudradjat A, 1984. 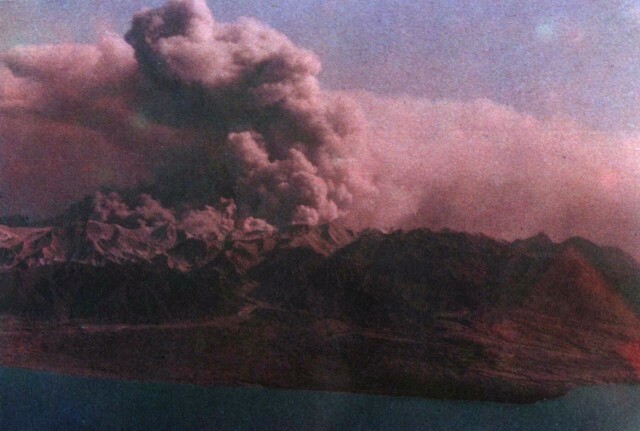 The devastating 1983 eruption of Colo volcano, Una-Una Island, central Sulawesi, Indonesia. Geol Jahrb, 75: 27-47. There is no Deformation History data available for Colo.
Ash mantles the summit of Colo volcano after a powerful explosive eruption in 1983. The volcano forms the isolated island of Una-Una in the middle of the Gulf of Tomini in northern Sulawesi. The broad, low volcano is truncated by a 2-km-wide caldera that contains a small central cone. Only three eruptions have been recorded in historical time. The last eruption, in 1983, produced pyroclastic flows that swept over most of the island shortly after all residents had been evacuated. Photo by M.S. 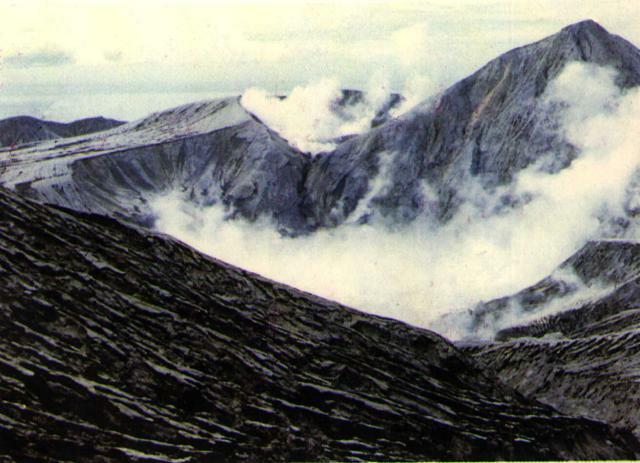 Santoso, 1983 (Volcanological Survey of Indonesia). A broad ash plume rises above Colo volcano on the island of Una-Una during the powerful 1983 eruption. Phreatic eruptions began on July 18. All inhabitants of the island were evacuated prior to the paroxysmal eruption at 1623 hrs on July 23, when pyroclastic flows devastated most of the island. Intermittent large explosive eruptions, some producing pyroclastic flows, continued until August 30, and minor ash eruptions lasted until October 10. White and sometimes gray "smoke" was reported November-December, presumably from phreatic eruptions. Photo courtesy of Volcanological Survey of Indonesia, 1983. Large Eruptions of Colo Information about large Quaternary eruptions (VEI >= 4) is cataloged in the Large Magnitude Explosive Volcanic Eruptions (LaMEVE) database of the Volcano Global Risk Identification and Analysis Project (VOGRIPA).